Normally Resque saves failed jobs in Redis, so you can both check the backtrace and retry the job. These feature is made up of Failure Backend mechanism. Let's write a simple email notification class and study about Failure Backend deeply. You can use your own Failure Backend in three steps. 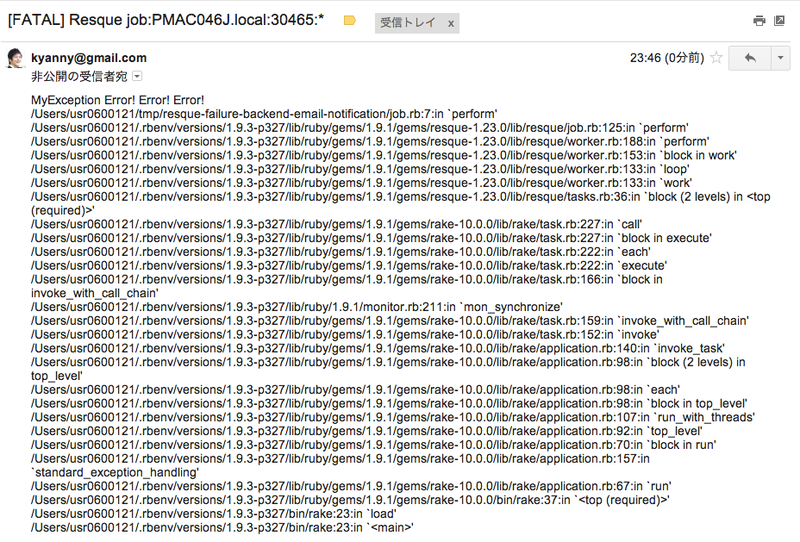 For example, an email notification Failure Backend is below. For to make Resque to use this Failure Backend, make the follow settings. In Rails case, these settings will fit at config/initializers/resque.rb. The default Failure Backend is Resque::Failure::Redis so failed jobs are saved to Redis. To use your own class, assign the Failure Backend class to Resque::Failure.backend=. But probably you want to use both Redis store and email notification, so try to use Resque::Failure::Multiple and to use multiple failure backends at a same time. When a job failed, you can receive an email notification without spoiling Redis store. Full example code is published at Gist.